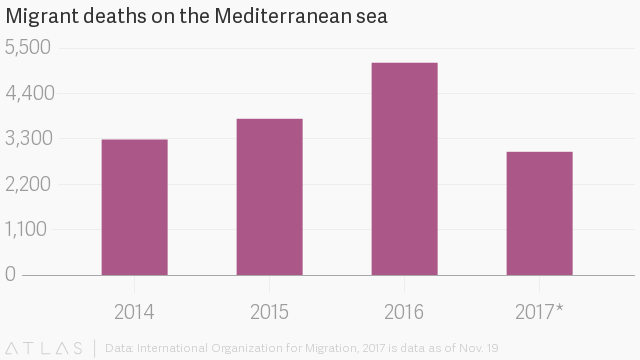 Hundreds of thousands of African migrants try to cross the Mediterranean into Europe every year in search of greener pastures. This year alone, over 160,000 migrants crossed successfully, data from International Organization for Migration shows. But not everyone has been lucky. As of Nov. 19, nearly 3,000 have died while trying to make the crossing in 2017. One of the most high profile incidents saw 26 young Nigerian women drown in the Mediterranean on Nov. 5. The women, most of whom were unidentified, were buried in Italy on Nov. 17. Their deaths and burial in Italy, without a Nigerian official in attendance, has drawn a lot of criticism directed at the government back home. The government insists it was not informed early enough of funeral arrangements by Italian authorities. The tragedy has seemingly reminded the government of the scale of its migrant problem. This week, it sent a high-powered delegation, including the speaker of the House of Representatives, to the International Conference on Human Trafficking in Rome. It has also launched a “ministerial committee” to investigate the deaths. But it’s unlikely the committee will find out anything new. Like many others, migrants from Nigeria brave the slim odds of getting into Europe in search of proverbial greener pastures because of the promise of a better life. Unable to find jobs at home (Nigeria’s unemployment rate has climbed for nine straight quarters), the prospect of a better life in European cities has repeatedly proven to be a compelling draw, data shows. 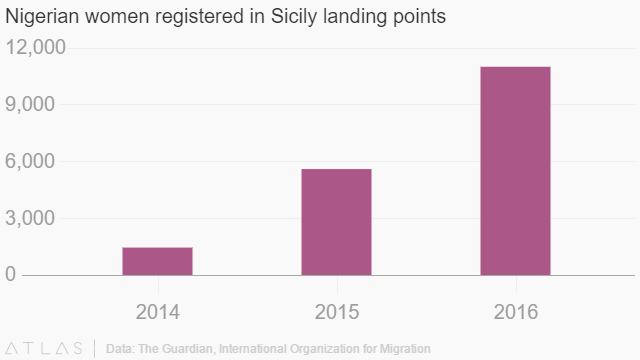 Last year, Nigeria accounted for the highest number of migrant arrivals by sea in Italy, surpassing Eritrea and, in between 2014 and 2016, the number of Nigerian women registered as arrivals in Italy has grown almost ten-fold. The perilous journey across the Mediterranean starts with a 1,300-mile drive across the Sahara desert to Libya. Once there, migrants then attempt to buy spots on ramshackle boats headed for Italy via the Mediterranean. But unfortunately for many, Libya often turns out to be the final destination rather than a thoroughfare. IOM reported in April, migrants’ dreams of Europe end if they get captured by militia groups and human traffickers who request ransoms in exchange for their freedom. Those unable to pay are often auctioned off in open slave markets. A CNN video report on the modern slave markets in Libya this month has sparked international outrage. Female migrants also face the prospect of being married off to militia fighters. Last year, documents recovered during a pro-government raid on Sirte, a former ISIL stronghold in Libya, showed that Nigerian women had been married to ISIL fighters who promised guns and explosive belts as dowries. But many other Nigerian women who become illegal migrants in Italy, are set for a life in prostitution controlled by local mafia.